The Show Starts on the Sidewalk! The glamorous Colonial Theatre shows the best of Hollywood, independent and foreign movies all year round on our three screens. We are a friendly locally run community theatre. We are easy to find in beautiful downtown Belfast with our brightly painted façade, neon marquee, and our life-size elephant “Hawthorne” trumpeting above High Street from our roof. The Colonial has offered entertainment to Belfast since 1912, opening on the very day the Titanic set sail. In those days live acts preceded the films so a stage was required in addition to the screen. 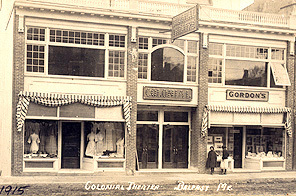 For the Colonial, at least, it was smooth sailing until a fire leveled the original building in 1923. 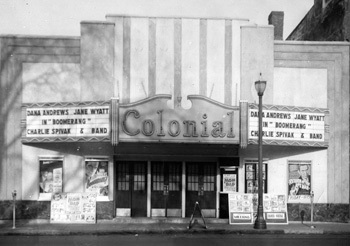 The present building was quickly built and ready for business in 1924, but in the interim the Colonial owners rented out the Opera House to continue the presentation of movies. Showing a variety of “moving pictures” as well as live acts, the shows slowly evolved from a mixed Vaudeville to an all-film format. 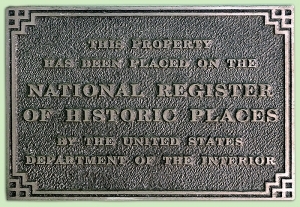 Our current stucco façade was added during a major renovation in 1947. The Art-Deco style had been all the rage, especially with movie house design, so after WWII this work was undertaken. During most of its life the theatre was owned by the Kurson family which operated theatres all over New England from their base in the Boston Theatre District. It was during the reign of manager Mr. John Grant, who loved and cared for the Colonial for over 50 years, that the auditorium was divided for very practical reasons. To save on heat during the 1970s energy crunch, the hall was shortened by abandoning the stage and moving the screen toward the audience with both doors from the lobby leading into one large but shorter theatre. 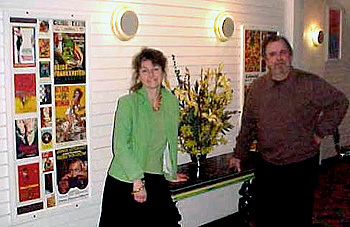 The lobby for a ten year period became a video rental shop capturing another bit of the movie viewing market. In the early 1980s the auditorium being used for movies was twinned, creating two theatres, thus two choices for movie goers with each of the two doors from the lobby leading into a separate theatre. 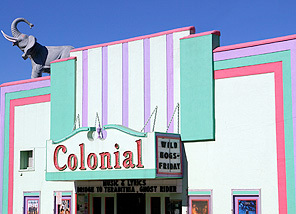 In 1995 the Colonial Theatre was purchased by local residents, Therese Bagnardi and Michael Hurley, from the second generation of theatre-operating Kursons who at 80 years old, were quite ready to retire. Therese had been considering a career change when her husband , Mike, flipping to the “for sale” ad in the local newspaper remarked, “Why don’t you buy the Colonial?” Three days later she did! In a burst of energy, the exterior & interiors were completely renovated with an Art Deco spirit. One year later, more changes as Mike saw room for further improvement. In order to gain access to the unused space with the stage his idea of tunneling under the other two theatres worked perfectly. After being abandoned for decades, major construction revived and unveiled the grand “front of the house” which features a new balcony, surround sound, and utilizes the original stage and brocade curtain. This brought the Colonial up to three screens with ever-larger movie choices! At that time all three theatres were named in honor of movie houses in Belfast’s past: Star, City and Dreamland. In the heyday of Hollywood a town of Belfast’s size would support several movie theatres which was exactly the case here, so there were some good names to choose from. On the grand day of April 12th, 2012 The Colonial Theatre celebrated 100 years of bringing the best of film and entertainment to Belfast, Maine. As caretakers of The Colonial Theatre we are proud to have celebrated this great year with all of you. 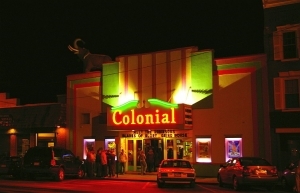 The Colonial has had many millions of theatre goers over the years and it looks forward to many more years and visitors.